During the Civil War, women made their own soap. Sometimes soap could be purchased at the general store, but many women preferred making their own. Land was cleared by chopping trees, pulling stumps, and burning bushes. The ashes left from these burnings were placed in a barrel called a "leach". The leach was put on top of a board and raised at one end. The bottom of the barrell had a slit in it where water could seep through, and a bucket was placed under the slit. As water passed throgh the ashes, it trickled out the slit as lye. It took quite a long time for the first few drops of lye to drip through to the bottom of the barrel, sometimes an entire day. Lye was very dangerous to work with and could burn the skin very badly. As well, the throat could be burned if the fumes were inhaled. The next step was to boil animal fat and water into tallow. The lye was then added to the tallow, and the tallow took away the strength of the lye. Then, depending on what batch of soap the pioneer was making, other ingredients were added to the boiling lye-tallow mixture. 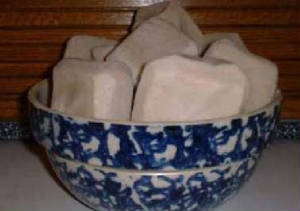 For bath soap, bayberry, lavender, or oats were added. For laundry soap, ammonia and borax were added. Finally, the liquid soap was poured into a pan or box to harden overnight, and it was cut into bars the following day. During the 19th century, wool was (as it is today) an intrical and important commodity for people. Naturally, it was used to make clothes, blankets, sweaters, mittens, etc. In some parts of the country, woolen goods were available in stores, but in the Westand in the South, people had to make their woolen products from scratch. Queen Victorian considered spinning wool into yarn as a sort of relaxing pasttime. some vegetable such as onions! Once dyed, the yarn was then woven into cloth on a loom. 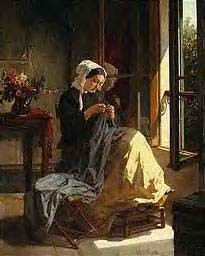 Clothes were primarily made at home, so there was always some sewing project going on. If it was not time to be making new clothes, then there were always exisiting clothes that need repairs, or some darning that needed to be done. Besides darning, knitting, and sewing, women often crocheted, cross-stitched, and sewed needlepoint as decorative doilies, table-runners, sachets, shawls, and reticules. A lady's needlework was often considered a refinement and that the lady was of good-breeding and well-mannered. There were no lights in a house, of course, but the fireplace did provide some light in the evenings, and women also made their own candles. This was an important and necessary task, but a chore that most children hated. It was messy and took a great deal of patience. The candle rod was slipped through the loops of ten or twenty wicks. Several rods filled with hanging wicks were then lowered into the hot wax, rod by rod. It was typically the children's job to dip the wicks, then take them out to dry and dip the next set, and so on. It would take many dippings to get the candles thick enough to last for even one evening! 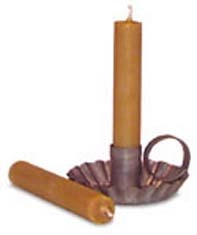 Another method of making candles was to pour hot tallow (grease) into wooden molds. The molds were made of tin or pewter, and they were set in a frame. Some of the frames held as many as 100 candle molds. Once the molds were cooled, the candles were lifted out by removing the top of the mold. The wax used for their candles came from animal (hog) and vegetable (corn) fat. Bayberries and beeswax were also used in making candles. Sometimes moose fat and bear oil was used. Boiling the fat in water until the water boiled away and the dirt was skimmed off made candle wax. When homemade candles were burned, they smelled similar to frying grease, but when they were made from bayberries, the fragrance was much more enjoyable. Women usually began canning preserves for the wintertime once the first summer and fall crops began to come into harvest. Women often took fruits and vegetables, blanched them in hot water, cooked them with sugar, salt, seasonings, or vinegar (whether they were making fruit jams, vegetable cans, or pickled items) and filled Mason jars (invented in the later 1840's) with the preserve. Jars were first boiled for sterilization before being filled and boiled again to seal. If jars were not heated to a high enough temperature, botulism, a deadly bacteria could grow in the jar and be accidentally consumed. Meats were sometimes pickled, but were usually smoked and seasoned in a smoke house, left to dry out to become jerky and other dried meats. 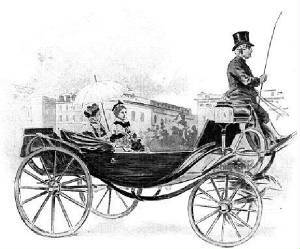 Taking a ride into town in a buggy or carriage was popular during the 1860's. The trip usually served two purposes: to get away from the house for a bit and to do the weekly shopping that was required. Women could see the latest fashions from Paris, hear the local news, learn about recent battles, and get some fresh air. A woman was always accompanied by another female or one of her servants. She never went anywhere alone. 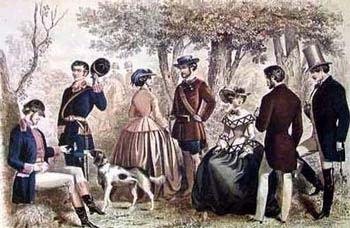 Women of higher social classes were often invited to join the men's hunting party. 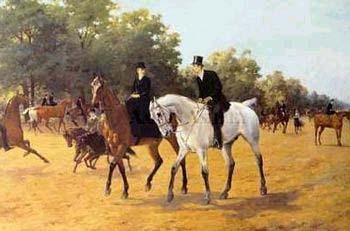 Most women rode horses side-saddle and enjoyed watching the men fox and small-game hunt with several hounds, bird-hunt, or deer-hunt. However, a few women did actually carry a small pistol of their own to join in the hunt. Some even carried a rifle. For most though, it was a day of riding, laughter, and socializing with the men in hopes of finding a suitable man to eventually marry. 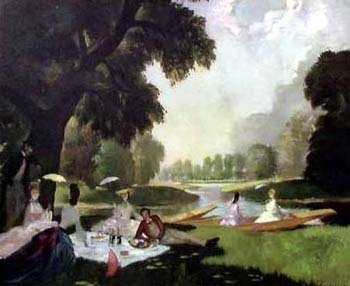 Picnics were very popular among higher social classes as different atmosphere to take dinner. 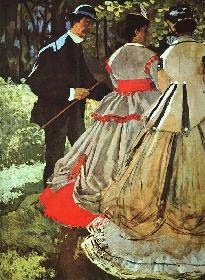 Instead of dinner in the parlor or dining room, ladies would accompany gentlemen out onto the plantation grounds or to a local park, be seated on a sprawling blanket, and nibble on small sandwiches and desserts, while enjoying the fresh air, a bit of sun, and socializing with other ladies and men. Women of all social classes enjoyed riding. Side-saddle was considered the appropriate way for ladies to ride a horse, not legs-astride a horse the way gentlemen rode. Riding habits and riding hats were a ladies attire, the habit skirt long enough to drape over a ladies legs to perserve modesty as she rode. Women were supposed to walk, trot, or gallop, but never break into a dead run or practice jumping as these were seen as male activities. Ladies usually rode in the early morning to prevent sunburn and heat exhustion of the later afternoon hours. 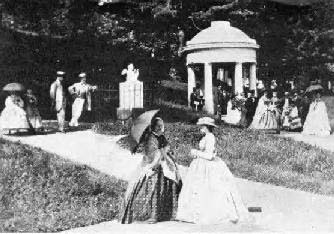 Women often went for strolls around their plantation or in the park. An early morning stroll was considered the only time a lady could be outdoors without a female chaperone, a servant, or her husband to accompany her. A lady used this time to herself for personal thinking, relaxation, poetry writing, and journal entries. Walks taken any other time of the day were used for socialization, exercise, shopping, and gossiping with other women. Reading was very important to a lady's education. Women usually did not attend a schoolhouse as a child, but were home-schooled by their mother, older siblings, nurse-maid, and nanny. When a girl was reaching her teens and the family was well-to-do, the girl would attend a girl's finishing school before returning home to "enter society" as a debutante. Books not only offered fiction and non-fiction for reading enjoyment, but a lady usually read books on manners, etiquette, sewing instruction, history, how to speak a foreign languauge (usually French or Latin), and managing a household. 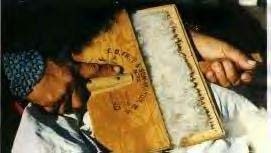 The most important book a lady could read, was of course, the Holy Bible. 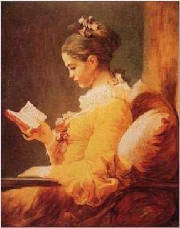 Reading was a lady's primary education and was considered a refinement if she could read and write very well.